A photo of one of the kids (my daughter or one of the cousins) from our week with family on Cook's Bay, the shallow southern end of Lake Simcoe quite near where I grew up. A mink family was nesting in the rocks just beside the dock, and we often found evidence of their feasts such as this discarded claw. 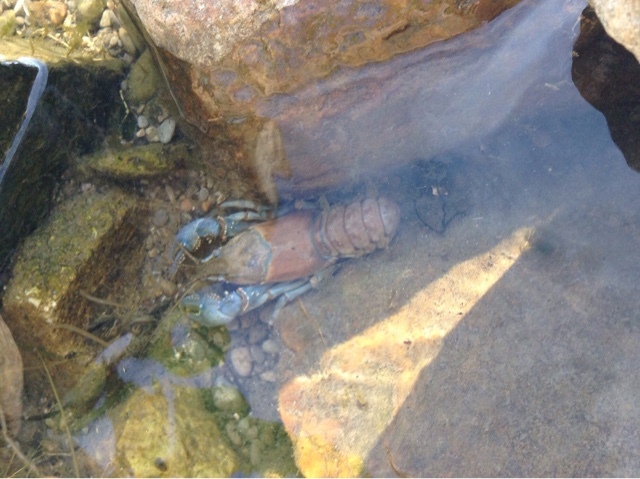 While my daughter was happy to hold and examine the claw (as seen in the top photo) she was happy to leave this large crayfish alone to rest, perhaps moulting, in the rocks beside the dock. I saw this wonderful list today, posted by the National Trust in the UK. It was followed by links to apps to download, all to help families keep track of their activities as they completed the list. It occurred to me that this might have been in response to the now-ubiquitous Pokemon Go game that has kids and adults alike running about outside, trying to gather as many Pokemon as they can and earning points for mileage like a gaming fitbit. I rather love the list, as I see many items on it I consider "must do" activities with students in class and with my own kids. 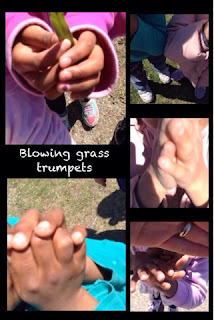 I laughed to see items such as: No.25 make a grass trumpet which so delighted several students in our class this spring. In April, after many attempts, one student managed to get a loud sound from her "grass trumpet". She was immensely proud of herself, and patiently taught her friends her strategy (which differed from mine). By the end of the week, we had a band of three. (click here to witness 3 students sharing their new-found noise-making skills). What have you been thinking about trying in your life? Maybe it’s time to take that leap of faith…. Heather's post was particularly meaningful to me, because our families met up for an afternoon during the trip she wrote about. We had met once before, at the Hawkins-Inspired Conference in Ontario, but while it was a playful experience it was in the company of adults. This time, with our families away from home in full vacation mode, we were making discoveries about our children alongside them as we played in tidal pools and enjoyed the vastness of the ocean. 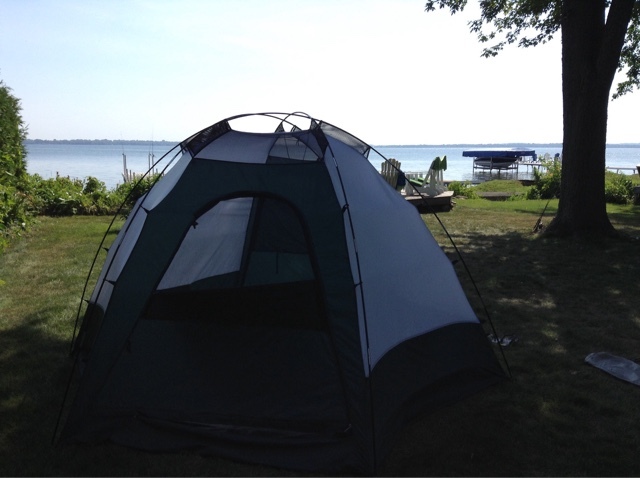 I wrote about my own aha's from that trip, mainly around self-regulation and the development of an environmental awareness that is possible when spending whole days on end outside. I hadn't responded to Rob's and Heather's queries, not in writing, but I had taken notes in my journal from the trip. Today, seeing the National Trust's #50things inspired me to go back, dig up what the kids had said when I asked them for their "must do by 12" submissions. I realize my new submission is a difficult one for younger children, but a wonderful goal to set as a group, such as a family. 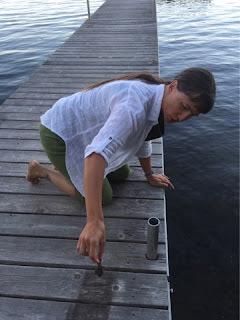 A few weeks ago, when we spent our time near the southern tip of Lake Simcoe, we talked about what we saw as we watched the sun go down over the bay. The kids now know much more about the larger lake that spreads northwards, our spot being like the fingernail on a large hand, pointing down towards Holland Landing, and wrist meeting Lake Couchiching in Orillia. They felt the cold waves in Kempenfelt Bay when we spent a beach day in Barrie, and compared that to the warm shallows of Cook's Bay where we were staying. 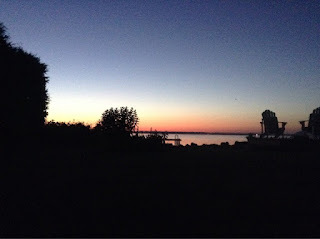 We heard a loon call at night, further south than we ever thought a loon would summer. On our way home, we crossed familiar waterways marked on the roads, and sighed when we crested the last hill before home, as Lake Ontario came into view, huge and blue before us. 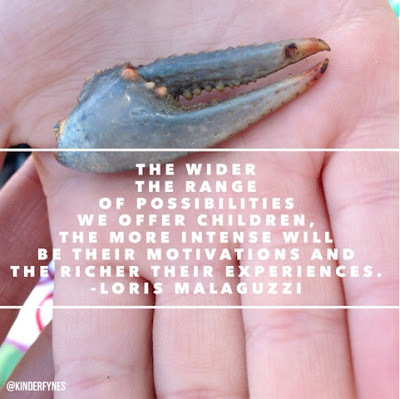 Getting outdoors together, whether with a class or with family, allows for kids to see things they might not see if playing alone or with friends. Being in wild or near-wild spaces helps us all slow down, notice life of all kinds around us. Our tent being dismantled on our last day at the lake - obscured from view, the dock and rocks where the mink scampered daily. Click here to see the mink on the move, or here for a friendly visit from various local creatures. The "full buck moon" seen through binoculars. Photo by my daughter. 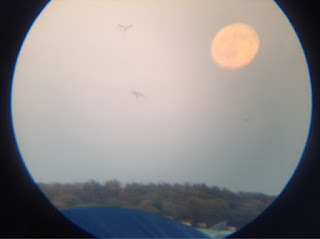 We stayed out as late as we could each night (mosquitoes being quite good at chasing us indoors or beside the smoky fire) to watch the "shift change" when swallows went to roost and the fast-flapping bats came out. Sunrise as seen from our tent. Worth waking at 5 AM. Me replacing a poor little catfish we found on the lawn. I thought it was dead, as I found it some 3 meters from the shore on the grass, but when I picked it up to inspect it, it gave a powerful "flip!" and I nearly dropped it in surprise. We had been watching herons, osprey and terns fishing all week; it was likely one of these fishing birds that dropped its wiggling prey. A damselfly nymph I caught (or did it catch me? 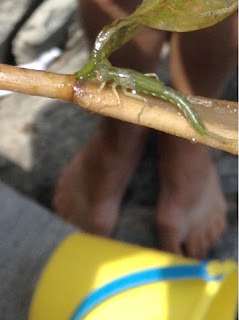 It did follow me while I swam) that was very spooky while swimming, but upon closer inspection became obvious after a blue adult damselfly landed on my arm. The kids were fascinated to discover something completely new. Truth be told, I was too. As I'm writing, my other open tab alerted me to the fact that someone had replied to my tweet, sharing the #50things list. Heather and Rob were chiming in with new ideas for how to grow and share our lists with others. @KinderFynes @nationaltrust @RangerRidley It would be neat to display a list like this at school and annotate with photos from the year! Here we are, at summer's half-way mark, and such a lovely long month ahead to try new things. Next week my daughter and I will once again spend a week at Swan Lake with the YRNC for this year's Rhythm of Learning in Nature, and I will compare notes with fellow eductors from Canada and around the world. Won't you add your own "must do" or "must see" ideas here? documentation - who is it for?